If Russia successfully annexes Crimea, what happens to the ethnic Ukrainian and Tartar population? If history is any guide, we should not be shocked by forced deportations. Frankly, they should probably consider themselves lucky if they do not take a detour through a Russian gulag. Residents of the Soviet occupied Kuril Islands were not so fortunate. 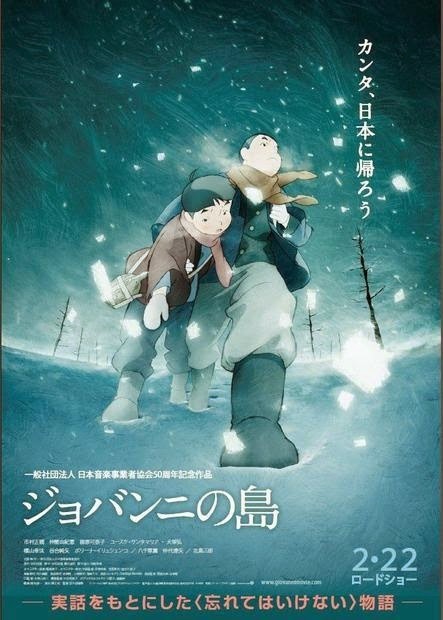 The Production I.G team best known for the Ghost in the Shell franchise revisits a painful episode of Japanese history with Mizuho Nishikubo’s Giovanni’s Island (trailer here), which screened during the 2014 New York International Children’s Film Festival. Giovanni and Campanella are not traditional Japanese names, but they are the main characters of Kenji Miyazawa’s fantastical classic, Night on the Galactic Railroad. Tatsuo Senō is so fond of the novel he named his sons Junpei and Kanta to roughly correlate. At the time of Japan’s surrender, the elder Senō is the island’s civil defense coordinator, but since he is not technically military, he is not rounded up with the other soldiers. Initially, rumors spread like wildfire of what the Americans would do when they arrive. Unfortunately, it is the Soviets instead. Needless to say, their arrival is quite disruptive for the island community. Many families, including the Senōs, are displaced to make room for the occupiers. Similarly, Junpei’s class is forced to share space with the lower grades to make room for the soldiers’ children. Still, he forms an unlikely friendship with the commander’s daughter Tanya that steadily develops romantic overtones. Sadly, the Soviets will do no favors for tweener romance. 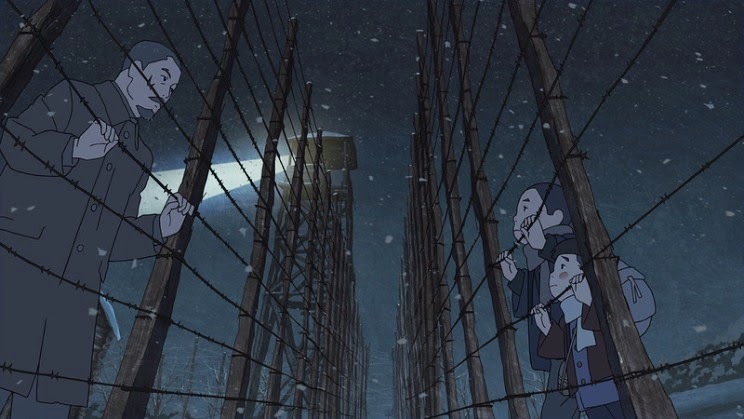 After his father is arrested for distributing rice to needy villagers (so much for “to each according to their needs”), Junpei, Kanta, and their school teacher Sawako (who long carried a torch for dad) are forced to board the supposed repatriation transport without him. Ominously though, they do not seem to be bearing south towards Japan. Frankly, screenwriters Shigemichi Sugita and Yoshiki Sakurai are remarkably restrained in their depiction of the Russian occupiers, perhaps for fear of reprisals. Nevertheless, the grim realities of the forcible deportations are inescapable. For all intents and purposes, the occupied islands were ethnically cleansed. Those familiar with Miyazawa’s short novel will also realize the Senō family is destined to experience acute tragedy. Indeed, the way the Galactic Railroad is weaved into Giovanni’s narrative is quite thoughtful and literate. Hardly stuck in denial, the film forthrightly acknowledges the misfortune of Koreans displaced by the Imperial military, whom the Russians never bothered to repatriate. There are also a few decent Russians in Giovanni (such as Tanya’s parents), but the Stalinist war machine is a brutal, impersonal fact of history. Much like Jack and the Cuckoo Clock Heart, Giovanni uses poetic imagery to soften the blow of the on-screen heartbreak. Yet, there is a maturity to the film and how its characters (especially the young) resolutely “endure the unendurable” that is quite powerful. Viewers will not feel bereft at the end, despite the grueling journey it takes us on. While it focuses quite intimately on the Senōs and those closest to them, it is a rather epic story. Featuring characters you will care about caught up in historical forces likely to repeat themselves, Giovanni’s Island is the sort of animated film adults will appreciate as much or more than children. Highly recommended as a legit big screen drama, Giovanni’s Island had its first screening outside of Japan at this year’s NYICFF. Patrons should keep an eye on their website, just in case another screening is added. Regardless, it should have a long life on the festival circuit. For additional NYICFF reviews also check out Steve Kopian’s coverage at Unseen Films.